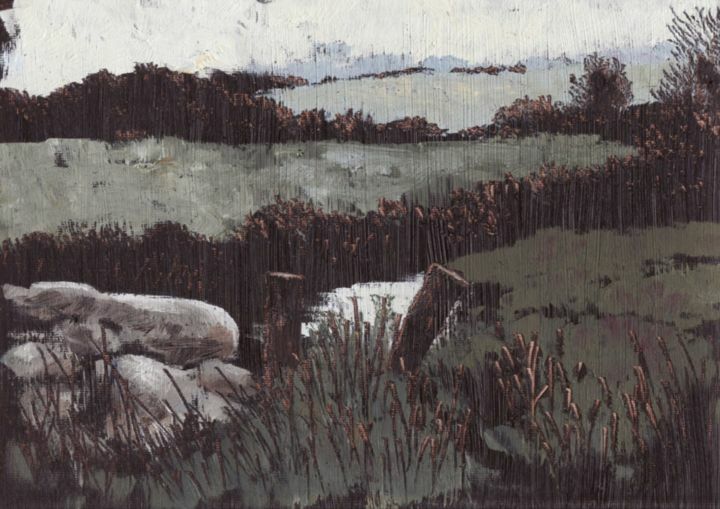 'Down By The Bridge' is an oil on paper of Donal's fields from the Aghthying Bridge just a few steps from our own home in Ballytrasna. When we bought our cottage back in the late 80's we had no running water so we used to get our water from the Aghthying stream then. The children loved this place and often played there for hours on end in the balmy sunny days with our little terrier, Jill. The Bridge is all over-grown now but it is still magical to walk down there at evening time to hear the beautiful bird-song. The painting is framed in an ornate wooden frame which is painted old-ochre. A set of limited edition prints, signed and stamped by the artist, is available; email Mícheál for full details.